What is a story that has ended without a beginning? We spend our lives writing our own. Rewriting it in when in different circumstances,from falling in love to losing a loved one. All of which that can be captured by a camera even when the story begins at the womb . This piece is dedicated to all the mothers and fathers who have lost their babies in the early and late stages of pregnancy. What begins with expectations, excitement and planning that unexpectedly ends before it even begins. Some would say that it doesn’t matter too much as the baby hadn’t developed. But that doesn’t take away the sorrow. The grief can still be as strong as losing a loved one, but carries one thing that losing someone doesn’t; the feeling of guilt. What did we do wrong? What didn’t we do right? Haunting negative thoughts that would cloud your mind, judgement and life in general. When did the story begin? As soon as every parent knows of the news, we begin rescripting our story and start scripting the life of the one or ones that were meant to be. It certainly isn’t the same as losing a child. But a loss is still a loss. We grieve to get over our pain. After grievence come hope. Hope for a better future to plan again. One of the many things that life teaches us, is nothing can be written the way we want it to to be as it may be already written for us. The other thing that life teaches us is that when we have love, faith and every other countless blessings as long as we can see them, there’s always a chance to try scripting our lives again. With every story there’s the beginning,the middle and inevitably an end. Once told, it’s the memory that lasts forever. 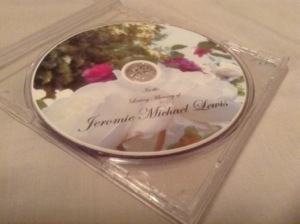 We’ve recently filmed and just finished the final edit of the funeral of Jeromie Michael Lewis.